Join us in Supporting Jeans Day in B.C. Jeans Day is almost here! This annual event is a province-wide fundraiser for the BC Children’s Hospital. Join over 200,000 participants across B.C. by purchasing a Jeans Day pin at London Drugs during the month of April and jean up on May 2. Your Canadian tuxedo never looked so good! Jeans Day is fun annual fundraising event for the BC Children’s Hospital that began back in 1990. By purchasing a $20 pin or a $5 button, you can help the folks at BC Children’s Hospital to provide care to children, prevent illness and injury, and conduct research to conquer childhood diseases. 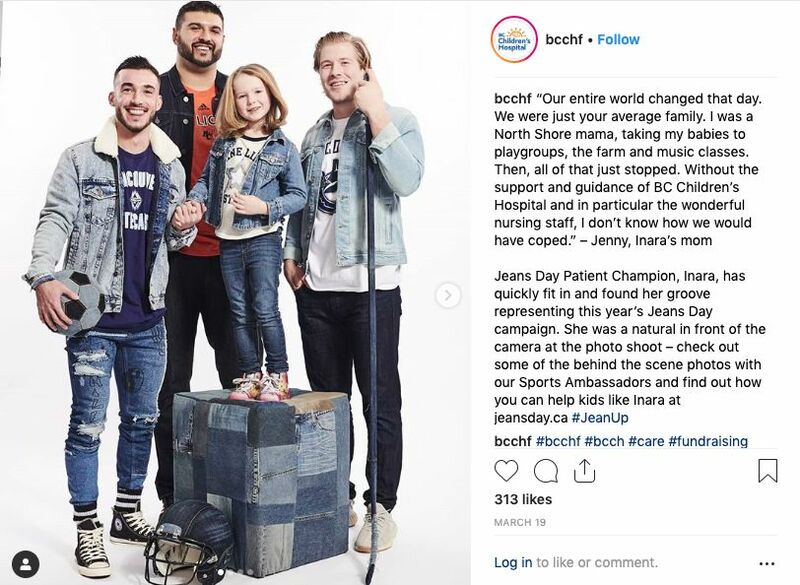 Since Jeans Day began 19 years ago, the event has raised over $21 million to improve the health of B.C.’s children. This year’s Jeans Day Patient Champion is Inara. In 2015, Inara’s family was hit by a virus, but three-year-old Inara didn’t get better like her parents and sister did. Instead she got worse, suffering from fatigue and developing red freckles all over her body. After admission to BC Children’s Hospital, Inara was diagnosed with leukemia. Inara’s two-and-a-half year treatment included surgeries, chemotherapy, lumbar punctures, and a multitude of blood tests. She was limited in what she could do outside of the hospital due to her weakened immune system, so she missed several years of a normal childhood. In the spring of 2018 Inara completed her last chemotherapy treatment, but she continues to visit BC Children’s Hospital for follow-up appointments. Join Inara and her family this May 2 by jeaning up and supporting the wonderful work that BC Children’s Hospital does. The easiest way to get involved this Jeans Day is to buy a pin or button at London Drugs or other participating retailers across B.C. Pins and buttons are already on sale and will be available for purchase until May 2. You can also become a Jeans Day Champion and sell buttons and pins in your own community. If you don’t want a pin or a button, you can donate online to support BC Children’s Hospital this Jeans Day. Spread the word about Jeans Day online using the hashtag #JeanUp and link to jeansday.ca. And of course, wear your Jeans Day pin or button proudly on May 2, along with your best head-to-toe denim look!